The internationally known, prestigious endurance race, "Les Deux Jours de Montcuq" is embarking on its 30th year of existence. During those 30 years the founder, Pierre Passemard traveled around the world observing and participating in other endurance races, gaining a lot of experience and contacts (including in Australia in the 80 th). This enabled him to be able to bring together, here in the South West of France, international riders of the highest caliber, forging it into one of the preeminent races of its kind. While many races have come and gone over the years, historically "Les Deux Jours de Montcuq is one of the oldest sustaining endurance races in the world. With few alterations, the course has remained the same, mapped over some of the most outstanding, unspoiled, rugged countryside of France relentlessly challenging some of the finest riders from all over the globe. With this in mind, the officials of the "Deux Jours de Montcuq" wish to invite you to enter the premier classic endurance race of France, to compete with some of the world's best riders and horses in the beautifully unique venue of the "Quercy Blanc" on the 30th anniversary of its running. The City of Auburn and the Endurance Capital Committee is planning another gala Street Party in Old Town Auburn on Saturday evening, October 7th, 2006. * Salute to a local hero's 25th finish of the WS100 - Tim Tweitmeyer! and to Hal Hall's 25 Tevis Cup Ride finishes - maybe 26 by then. Bring the family and enjoy another evening reflecting on the awesome feats performed in our own fabulous "backyard". Tom Paleczny and Steve Bond recently rode Raemes Magiciann to gold medal wins a few weeks ago. Magiciann is considered to be a bit of a miracle horse. Rather than ride his horse, Steve Bond sometimes chooses to chase after it. Bond was recently in Quebec with his parents Lesley and Tom Paleczny, competing in the Northwind Challenge Canadian Championships. The team brought home gold in both the 20-mile ride and tie, and the 50-mile endurance race. "We have to be fit too," said Bond, sitting down in his family's equestrian centre on Puddicombe Road. A ride and tie isn't a new event, but is a relatively unknown event outside of equestrian circles. Two humans and one horse make up a team -- in this case, Bond and friend Eric Schmidt, along with 13-year-old Anglo-Arab breed Raemes Magiciann. In this case, the course was 20 miles along. In a mass start, horses line up with one rider, and one person on foot. The first rider takes off ahead on the trail and ties the horse to a tree. That rider then takes off on foot, while the other teammate catches up, hops on the horse and continues to ride. This leap frog practice continues until the end of the course, and the fastest team wins. "Endurance racing is quite a popular sport right now," said Tom Paleczny. The course is set, the firewood cut and the arrows are being dusted off as the Lachlan Endurance Rider Club prepares to host its annual programme of endurance riding at the Woodstock Showground on the weekend of 23rd and 24th September. Riders are expected from all around the State, with many horses coming to do a final hit out before the State Championships the following weekend at Wyndyer, near Mudgee. Many of the local identities will also be taking part with Alan & Erika Lindsay, Annette Bailey, Nikki Tucker, Robin Gossip, Di Cameron, Erica Allan, Louise Baker, just to name a few who will be enjoying their home turf. Scheduled is an 80km ride which will cover two legs, the first being 50km and the 2nd 30kms. The 40km training ride will travel over the majority of the 1st Leg of the 80km ride with a very enjoyable 20km social ride planned for those wanting to have a taste of the sport. Horses for the 80km and 40km rides will be vetted on Saturday commencing at 1pm with the actual rides commencing on Sunday morning at 5.30am and 6.00am consecutively. Entries for the social ride are being taken either on Saturday or, to make things a little easier for those wanting to participate in this ride, also on Sunday morning commencing at 8am to 9am with the ride starting at 9.30am. Once again, the Cowra Cadet Corp will be catering a two course dinner for $10 on Saturday night and will also be manning some of the many gates around the course, which will take in local farming and grazing properties, as well as historic stock routes in the Woodstock district. Due to the difficulties the town is experiencing at the moment, the Club is subsidising all prizes for the winners, with the exception of Cowra & Holmwood Wreckers who continue to be great supporters of the Club. If business houses in Cowra are interested in supporting this wonderful institution that continues in the District, don't hesitate to contact the Ride Secretary, Helen Brown on 63450107. Helen is also the contact to nominate for any of the above rides or for any information regarding the weekend. AUBURN, Ca. ?The American Endurance Conference (AERC) is proud to announce Luitpold Pharmaceuticals, Inc. as its new Platinum Sponsor and AERC National Mileage Sponsor. ?Luitpold Pharmaceuticals, Inc., the makers of Adequan® (POLYSULFATED GLYCOSAMINOGLYCAN), is honored to be the ?Official Joint Therapy? of AERC,? said Allyn Mann, Senior Manager of the Animal Health Division of Luitpold Pharmaceuticals, Inc. ?We are excited to support a group of riders and owners who understand the importance of maintaining healthy, functioning joints. Any time you plan to ride a horse 50 or 100 miles, their legs take a beating. Adequan® helps to keep their joints healthy so they can participate in these rides.? AERC President and veteran endurance rider Stagg Newmann, who uses Adequan® on his own competition horses as part of their routine joint therapy, is delighted with the partnership. ?Given what we ask of our horses over years and miles of competition, they deserve the best care we can provide, including the best joint therapy.? Adequan® restores synovial lubrication to facilitate joint movement by inducing a rapid, significant increase of synovial hyaluronic acid within 24 hours of intramuscular injection. Adequan® decreases inflammation of the synovial membrane, relieves pain caused by the swelling and inflammation associated with joint disease, inhibits harmful enzymes that attack the synovial fluid and cartilage and helps restore the natural balanced ?wear and repair? cycle within the joint. ?Endurance riding is an extreme test for our equines, and therefore they require the utmost care and conditioning to be successful,? said AERC spokesperson Randy Eiland. ?AERC is proud that we put our horse?s welfare above all else, making Adequan® the perfect sponsor for AERC. The proper use of Adequan® not only protects our horses? joints from naturally occurring wear and repair, it also allows these great animals to compete, be active and lead productive lives well into what we used to consider old age. I can?t think of a more appropriate fit than Adequan® and AERC.? Luitpold Pharmaceuticals, Inc. has developed an animated CD that takes the viewer on a journey through the joint of a horse. It helps the viewer understand how a healthy joint functions, what happens when damage occurs, and the various FDA-approved treatment options and how well they work to improve the health of the joint. To obtain a copy of the CD, call (800) 972-9247, or view it at http://www.adequan.com. Gloria Vanderford - not sure - a Rushcreek horse? Netherlands Takes Gold in Zebah na Morave!! Carmen Romaer held of a strong challenge by Carlo Di Battisa of Itally and Jean Daniel Aiello of France to capture Gold at the 2006 European Endurance Championship for Young Riders held today in Zebah. A field of 57 riders from across Europe competed in the 120km event which features a field of highly competative young endurance riders! In conjunction with the YR/J championship, they are hosting a breeders show. Simuliar to what was done at Compienge in France. 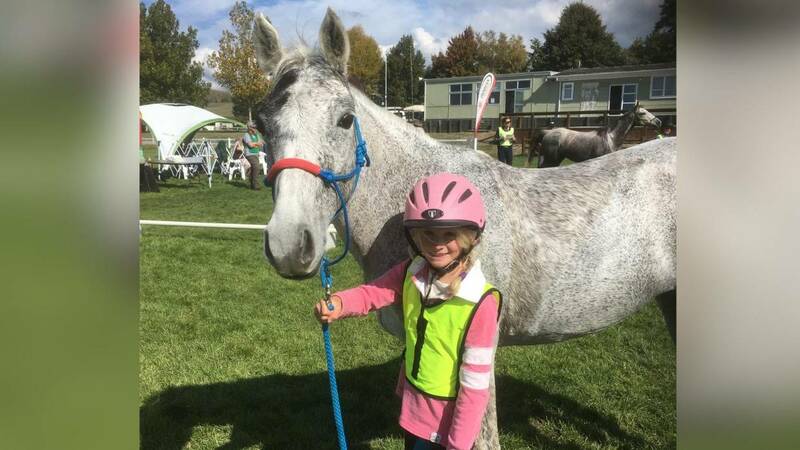 EQUINE ace Alison Nisbet and her Highland pony Dunedin Victor are proving distance is no object when it comes to endurance riding. For Vic, as she calls him, won the top pony award at the Scottish Endurance Riding Championships at Yetholm in the Borders recently. family and Czech sport in general. feel part of the international equestrian family. and the spectators an enjoyable time. Willa Botland riding Koringkloof Deena are first to finish at the 2006 Saldanha CEI***160km event held at the South African Military Academy in Saldanah Bay South Africa. 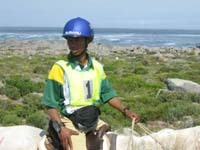 This year's Saldanha event is the first time that the Inter Province Challenge has also provided FEI divisions. Always a huge effort is required to complete this ride successfully to the veterinary team's satisfaction on Friday afternoon after riding 80kms per day for 5 successive days over some of the roughest country that one would dare to take a horse through. The Lachlan club only had 3 entries in the 400kms event this year, with all three successful, with the rest of the field success rate of 60% this was a very good result. Karen Rhodes made it buckle no. 13 of her 14 starts, a very consistent completer with her horse "Shadow". Karen will have to front up again next year now as the record no. of buckles earned by any rider is 14, and it would be great to see another local on top of the completion lists. Local horse "Kintamani Fosta" remains at the top of the horse buckle list with 10 out of 11 successes even though he has not competed in this ride since 1998 as he is now 27 years young. Alan Lindsay made a return after 8 years to the tracks of St.Albans riding his homebred "Kintamani Charisma" over the 400kms to earn his 8th buckle, accompanying his daughter Erika riding "Kinitamani Silver Motif" for her first attempt at the Marathon distance. Both Erika and Motif coped easily with the day to day workload with youth on their side and great support from mum and dad. Interestingly, both the sires of Charisma and Motif completed Shahzada many years ago. Shahzada was a grey Arab stallion, foaled in 1913 at Mr H.C. Stephens' stud in England. Shahzada's sire Mootrub, was purchased by General John Hills in India soon after he arrived from Arabia. He won races in India and numerous championships and prizes in the U.K. Shahzada's dam Ruth Kesia (descended from the desert bred mare Kesia), was acquired from the Gomassa tribe of the Sabaa Anazeh by Major Robert Upton. The mares from the tribe were noted for their fine free-trotting action. I stood in this very arena 14 days ago at the sunrise of this 5th FEI World Equestrian Games and I shared with you my hopes and dreams that this global celebration of the horse would provide a platform for a new dawn for the horse world and you have proved us right even beyond our wildest dreams, and expectations. Your welcome has been seen by this generation of horsemen and women and will be recorded in the chapters of equestrian history. I say to you on behalf of all those who have basked in the warmth of your hospitality "Wir lieben Aachen". You have been able to provide the substance and platform to make these Games possible, and I know that you will join me in saying that it is the athletes who have given it the breath of life and moulded its soul. Their performances in the arenas and their statesman like behaviour outside the arenas have been an example to all.